Manchester United boss Jose Mourinho has criticised the pitch for his side's Europa League match against Russian side FC Rostov on Thursday. Rostov, fifth in the Russian Premier League, play at the Olimp-2 which was built in 1930 and has a capacity of just over 15,000. Ahead of the last-16, first leg tie, Mourinho said: "It's hard for me to believe we are going to play on that field - if you can call it a field. "I don't know which team to play." 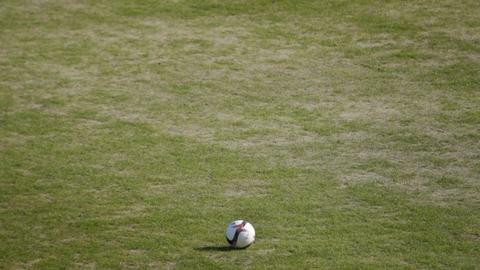 Uefa told BBC Sport the pitch "may not be in perfect condition, but has been deemed playable" following a pitch inspection on Wednesday. "The match will go ahead as scheduled," a spokesperson added. Mourinho drew comparisons with the quagmire that saw United's pre-season friendly against Manchester City in Beijing called off. The Portuguese manager says the pitch could affect his team selection. Armenian midfielder Henrikh Mkhitaryan is available after missing two games with a hamstring injury, but now Mourinho does not know whether to risk him. "I don't know what team to play, really. I don't know if Henrikh Mkhitaryan is going to play, I don't know," said Mourinho. In December, Mourinho was angered by Uefa making United play the Europa League group-stage decider at Zorya Luhansk on a frozen pitch. Asked about his latest grievance he said: "I just had a quick contact with one gentleman from Uefa when I was looking at the pitch and when I told him about my concerns, the gentleman just told me, 'The players are insured, if something happens no problem'."